Hey everyone, in this video, I'm explaining a trick that I have discovered a couple of years ago which would be a gamechanger for guest posting blogs. 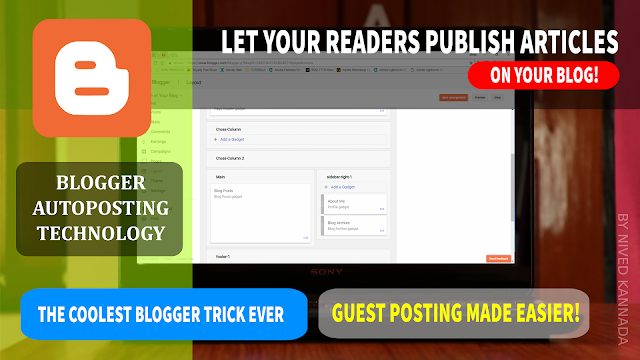 If you have a blogger blog in which you would like to set up guest posting so that anyone visiting your blog will also be able to write and publish contents straight into your blog from your blog itself. No need of emailing or stuff like that. Set this up once and you're ready to go. And well, if you're scared of coding, then don't worry. Because, to set this up, you just need a skill to follow my steps and no coding is involved in this setup process. Hope you will find this video helpful. Please subscribe to my channel for more helpful videos like this.